In the News | Custom Prosthetic Designs, Inc.
February 20, 2019 Robert Barron and patient Laura Schild appeared on "Botched" On E! Network. The segment is titled "Breast Lumps and Empty Noses". January 11, 2019 Robert Barron and burn survivor patient Samantha Diaz appeared on "Primer Impacto", which aired on Univision. The segment's title is "Impacto Positivo'. Ms.Diaz lost an eye, ear and her nose. Robert Barron preformed a miracle, Samantha received and eye prosthesis, an ear prosthesis and a nose prosthesis. November 19, 2018 Robert Barron and burn survivor patient Samantha Diaz appeared on ABC Local 10 News in Miami, Florida. It was titled "Face of Courage: CIA-Inspired Prosthetics Help Burn Victim Blend In". In the Loudoun Times-Mirror 2018 "Best of Loudoun" Robert Barron was voted as the "Best Medical Specialist In Loudoun". Robert Barron has been featured in the National Geographic book entitled "Veterans Voices: Remarkable Stories of Heroism, Sacrifice, and Honor" by authors Robert H. Miller and Andrew Wakeford. Through intimate photographs and poignant stories, this heart-rending book showcases the courage, heroics, and sacrifice of selected U.S. soldiers and veterans. This deeply moving, timely celebration of veterans highlights the heroes in our midst by bringing these brave men and women to life. Veterans Voices blends beauty, impact and gorgeous photographic displays with inspiring storytelling. Robert Barron will be speaking at the Lakeside Foundation 24th Annual Gala Dinner scheduled for Friday, December 7, 2012 at Rochester Riverside Convention Center in Rochester, New York. Read more about this event in the Democrat and Chronicle. Also click here to view the list of disguished speakers. "About Face: The Pat Stamp Story", February 7, 2012 part one and two series and February 8, 2012 part three and four series, 5p.m. (eastern); Curtis Rumbolt interview Patrick Stamp, patient of Robert Barron. An explosion on a tanker ship took a lot from Patrick Stamp including his face; follow his journey to recovery and finding Robert Barron who has transformed Patrick life. CBC, The Canadian Broadcasting Corporation, Newfoundland and Labrador. "Dramatically Increasing the Quality of Life with Prosthetic Devices", CCA Network, Spring 2011 Newsletter, pp. 14-15. Robert Barron spoke at The Phoenix Society's 22nd Annual World Burn Congress, October 23, 2010, Galveston, Texas. NBC Today Show, July 1, 2010, 7 - 9 a.m. (eastern); Anne Curry interviews Donnie Fritts, patient of Robert Barron. "Man Without a Face," 11Alive.com, Atlanta, Georgia; interview with Donnie Fritts, patient of Robert Barron. Robert Barron was a guest speaker at the 20th Annual Cher's Family Retreat, Children's Craniofacial Association (CCA), held in Boston, Massachusetts, June 24 - 27, 2010. To learn more about CCA, go to the CCAkids.org website. 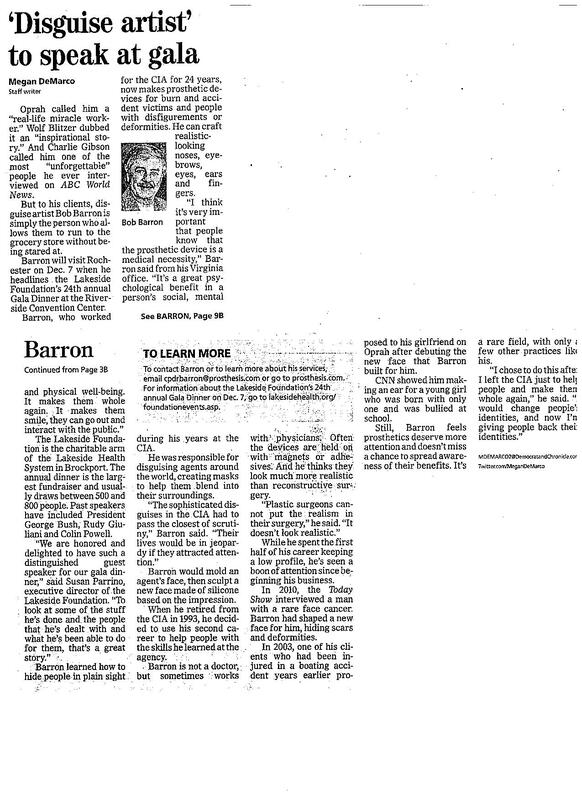 "From CIA Disguises to Prosthetics," The Washington Post Online, May 22, 2007. NOTE: These pictures have also been distributed in numerous e-mail messages and blog postings under the titles "Story With No Words," Story Without Words," and "A Story That Needs No Words." Clinical Anaplastologist's Lifelike Prosthetics Change Lives, Ann's Learning Disabilities Blog, by Ann Logsdon on About.com Guide to Learning Disabilities. Posted April 16, 2009. http://learningdisabilities.about.com/b/2009/04/16/clinical-anaplastologists-lifelike-prosthetics-change-lives.htm (Printable PDF). Living the Life, March 10, 2008, Christian Broadcasting Network, ABC Family Channel, 9:30 a.m. (eastern). The People of the CIA: Robert Barron, The Making of an Artist, Featured Story Archive, The Central Intelligence Agency Website, posted February 7, 2008. KSDK-TV (St. Louis) interview by NewsChannel 5's Mike Bush with Bob and patient Joey Alles, November 2, 2007, 10 pm (central); channel 5 in St. Louis, channel 14 in Illinois. Interview also available online following broadcast. WUSA Channel 9 News, Washington, DC, June 29, 2007, 5:00 pm (eastern). The Art of Living, Retirement Living Television (RTL), Comcast CN8, DIRECTV Channel 238, February 2, 2007. "Putting My Best Face Forward," by Donna Smith, The Braille Forum, The American Council of the Blind, Winter 2007, Vol. XLV, No. 5. "CIA's Master of Disguise," The Insider with Pat O'brien and Lara Spencer, interview with Bob and Carissa Fehrle, December 4, 2006. "CIA Disguise Master Designs New Ear for Seven Year-Old Boy," Inside Edition with Deborah Norville, May 23 and 24, 2006. "Meet the CIA's Master of Disguise," The Insider with Pat O'brien and Lara Spencer, April 8, 2006. "CIA FACE FIXER - Viewer Follow-up," The Insider with Pat O'brien and Lara Spencer, March 1, 2006. "Boy Trades Patch for Prosthetic Eye," ABC News Good Morning America, with Charlie Gibson and Diane Sawyer, March 1, 2006. "CIA FACE FIXER," The Insider with Pat O'brien and Lara Spencer, interview with Bob and patients, February 16, 2006. "Out of Hiding," KTRK-TV, ABC 13 Eyewitness News, February 7, 2006. "Barron Helped Elijah Look Like His Twin," The Friday Show with Vivica A. Fox, and The Montel Williams Show, January 1, 2006. "Ex-CIA Disguise Master Helps Disfigured People," Agence France-Presse, Dec 11, 2005. "Master of Disguise Changes Many Lives: Former CIA Specialist Creates New Faces for the Disfigured," ABC News Good Morning America, November 29, 2005. "A Thanksgiving Blessing: He Made Set of Oklahoma 6-Year-Olds Twins Again," Du Quoin Evening Call, November 23, 2005. "Stop Teasing Me Just Because I Look Different," The Maury Show, October 20, 2005. "Former CIA Employee Finds Second Career While Working Undercover," Loudoun Business, October 2005, p. 10. "Mission Possible: Former CIA Disguise Specialist Constructs Happy Faces," Leesburg Today, August 26, 2005, p. B1. "Extreme Surgery," The Discovery Health Channel, April 6, 2005 at 10 pm, April 7, 2005 at 1 am, and April 11, 2005 at 4 am. Fox News Sunday with Chris Wallace: Power Player, March 6, 2005. Interview with Robert Barron. Home Delivery, September 21, 2004, Warner Brothers "WB" TV. Program with Robert Barron and patient, Jackson Wood. RE-BROADCASTED on March 15, 2005. "Luke's New Ear," The Daily Journal, Febrary 21, 2005, p. 1. Life & Style, February 22 or 23, 2005 (depending on your viewing area). Robert Barron and patient, Hannah Shainholtz, will be appearing on the Warner Brothers "WB" and Oxygen Networks. "FOLLOW-UP -- TLC For Nurse: A Prosthetic Eye," CBS The Early Show, with Harry Smith, Thursday, December 23, 2004. "The Face Maker," Northwest Afternoon, KOMO-TV, Seattle, WA, Channel 4, 3 - 4 pm (pacific), November 8, 2004.